Bordertown is a new animated series from executive producer Mark Hentemann (Family Guy). 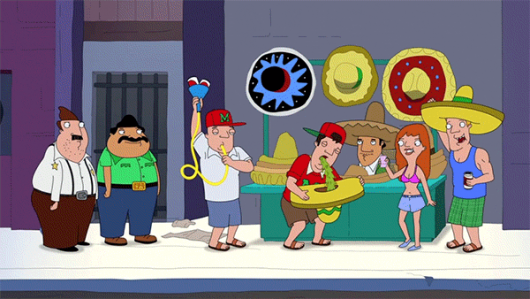 Much like the show it’ll draw its biggest comparisons to, Bordertown is a raunchy, politically incorrect, and yet very socially aware comedy. Joining Hentemann on stage at New York Comic-Con on Saturday night were writer Lalo Alcaraz, and stars Hank Azaria, Alex Borstein, Nicholas Gonzalez, and Judah Friedlander. As a lifelong fan of The Simpsons and Family Guy, being this close to Chief Wiggum and Lois Griffin was a great experience. 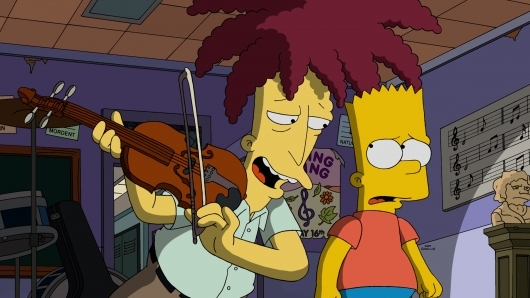 ‘The Simpsons’ To Kill Off Another Character; Who Will It Be?! Usually when characters die on an animated comedy series, they’re back and perfectly fine by the next episode. But sometimes an animated series kills off a character permanently, whether it be because the actor who voices the character has to leave the show, there’s a dispute between actor and producers, or maybe because the show’s makers just don’t like that character anymore. The last time The Simpsons killed off a character—or “did it,” as some like to say—was back in the year 2000 when Ned Flanders’ wife Maude fell to her death. 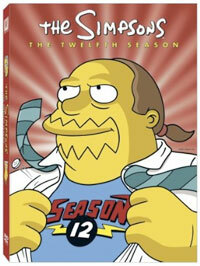 Now executive producer Al Jean has revealed that another character will soon meet their demise. Back in February, a leaked picture (shown at right) of what was supposedly one of the new CGI Smurfs being created for the live-action/CG hybrid family flick, The Smurfs. Since then, most of the attention being given to this movie was toward Hank Azaria being cast as Gargamel and our first looks at the actor in full costume and running around New York City. Now, we return our attention to those little blue creatures, who are finally making their debut. USA Today has the very first image showing off the Smurfs in all of their full-color CGI glory as they hang out in Times Square. The image features Grouchy Smurf, Papa Smurf, and Clumsy Smurf. 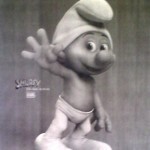 Keep on moving to check out this first peek at those lovable Smurfs. It’s absolutely mind-numbing how much press The Smurfs movie is getting based solely on the fact that Hank Azaria is playing the evil sorcerer Gargamel, but it’s true. I’m sure many are surprised at how many times the live-action/CGI hybrid movie has been popping up in the news, and surely no one is happier than the producers. The latest bit comes from someone in New York City (via /Film) who was able to catch some of the movie being filmed on their cell phone. 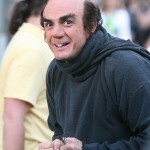 The scenes they were filming involve Gargamel outside of the famed toy store FAO Schwartz looking for the Smurfs. There’s also a sequence where in bumps into fellow star Neil Patrick Harris as he exits a store. Be sure to head on over to the other side to see both of these videos. Whether you’re excited for the movie or not, they should help you to solidify your stance on the final product and whether or not you want to see it. Very few people are excited about the prospect of a live-action/CGI hybrid movie based on the animated childhood favorite, The Smurfs. Even so, when it was announced that fan-favorite Hank Azaria would be playing the evil Gargamel, you couldn’t help but giggle a little at the thought. Now comes the very first image of Mr. Azaria in full Gargamel makeup and attire by way of Splash News (via ComingSoon), and fans of the old cartoon and this casting choice will surely enjoy taking a peek at how the actor looks. Brew your favorite potion, say the magic words, and slip over to the bottom of this post to see Hank Azaria as Gargamel in The Smurfs! Entertainment Weekly has learned of some new names that have been cast in the upcoming live-action/CGI hybrid adaptation of the animated television series, The Smurfs. 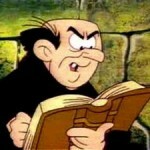 The most amusing of these is Hank Azaria, who has been cast in the role of the evil Sorcerer, Gargamel. Initially, reports indicated that Azaria would be simply voicing the role, which seemed strange for a human character in a partially live-action film; but co-star Neil Patrick Harris confirmed via his Twitter account that the role would in fact be live and in the flesh. I’ll be honest, when I found out the exhibits at the Museum of Natural History would be coming to life on screen once more in Night at the Museum: Battle of the Smithsonian I wasn’t all that enthusiastic. I figured the “magic” was already revealed in the first movie and that this sequel would just be more of the same. 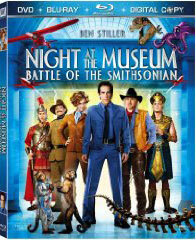 Let’s face it, the first film, which starred Ben Stiller as Larry Daley, a night guard at the Museum of Natural History in New York, was a hit, so why mess with a perfect formula? That’s why screenwriters Thomas Lennon and Robert Ben Garant were smart enough to stick with what drew audiences in initially — the inanimate exhibit figures coming to life at sundown and Larry fighting villains attempting to gain control of a powerful object — while making it much more than just a simple repeat of its predecessor. The sequel finds Larry out of his museum night guard duds and into the role of CEO of Daley Devices, the company founded to sell his inventions, like the The Glow-In-The-Dark Flashlight and The Unloseable Keyring. The successful Larry decides to visit his old place of employment, the Museum of Natural History, the setting of 2006’s Night at the Museum, which is now closed for renovations and its famous exhibits packed away in crates to be sent to permanent storage at the Smithsonian Institute’s Federal Archives in Washington DC. After hours, the figures come to life and Teddy Roosevelt (Robin Williams) explains that the Pharaoh Ahkmenrah’s Tablet, which is what animates the figures at sundown, won’t be going to the Archives with everyone else. While the situation is dire for his friends, Larry is distracted by his phone’s incoming messages and all of his business ventures to do anything about it. As far back as I can remember The Simpsons has been a part of my life. Growing up with the first family of Springfield, Any State USA since their Christmas special first aired in late 1989 I could see parts of myself and my own family in Matt Groening’s brilliant creation. Being a reader, a bit of a brain, and somehow able to stand outside the rest of my family and observe their strange behavior with the perspective of a seasoned psychiatrist, I could always relate to oldest daughter Lisa (voiced by Yeardley Smith), while my dad (who I was named after) took after intellectually challenged yet well-meaning father Homer (voiced by Dan Castellenata) somewhat (at least when he was around). Mother Marge (voiced by Julie Kavner), full of motherly wisdom and ready to be the glue that held the family together at all times, naturally reminded me of my own mom Carolyn. Then there was underachiever (and proud of it) brother Bart (voiced by Nancy Cartwright), whose tendency to raise hell without a moment’s hesitation continuously brought my own younger siblings Sean and Lisa. Little Maggie (voiced by someone sucking on a pacifier) could be representative of us all when we’re at that age. Besides them there’s the show’s sizable supporting cast. Who among us has never had a Bible-thumping neighbor like Ned Flanders, or a greedy employer like Montgomery Burns? You may have had a conservative principal like Seymour Skinner or encountered a bartender like Moe. 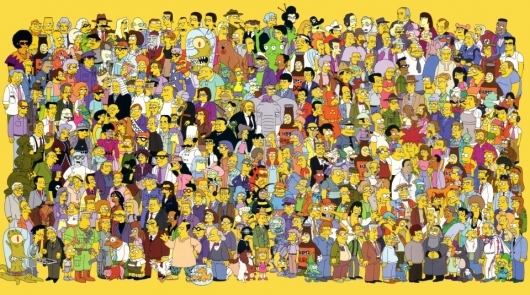 The townspeople who populate Springfield, a city which appears to be all American cities and none of them, may have come from the imaginations of a brilliant writing staff and voice cast (not to mention some very talented animators) but most of these characters are bound to strike a few of us as a bit familiar.